One step forward. Two steps back. The Tufts scholarship that put Nora Stuart on the path to becoming a Boston medical specialist was a step forward. Being hit by a car and then overhearing her boyfriend hit on another doctor when she thought she was dying? Two major steps back. Injured in more ways than one, Nora feels her carefully built life cracking at the edges. There's only one place to land: home. But the tiny Maine community she left fifteen years ago doesn't necessarily want her. At every turn, someone holds the prodigal daughter of Scupper Island responsible for small-town drama and big-time disappointments. With a tough islander mother who's always been distant and a wild-child sister in jail, unable to raise her daughter--a withdrawn teen as eager to ditch the island as Nora once was--Nora has her work cut out for her if she's going to take what might be her last chance to mend the family. But as some relationships crumble around her, others unexpectedly strengthen. Balancing loss and opportunity, a dark event from her past with hope for the future, Nora will discover that tackling old pain makes room for promise...and the chance to begin again. 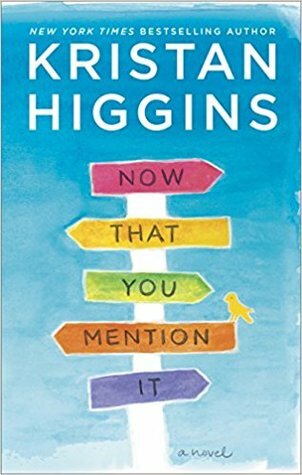 About the Author: Kristan Higgins is the New York Times, Publishers Weekly and USA TODAY bestselling author whose books have been translated into more than twenty languages. She has received dozens of awards and accolades, including starred reviews from Publishers Weekly, Library Journal, The New York Journal of Books and Kirkus. Kristan lives in Connecticut with her heroic firefighter husband, two atypically affectionate children, a neurotic rescue mutt and an occasionally friendly cat. Noteworthy experiences while reading this book: A great book if your looking for something a little on the lighter side of things. I read this in one sitting and it really made me feel hopeful when I finished. Notes and Opinions: This is a book to read if you need something uplifting. This past week after being robbed and being injured this one really made my day. I couldnt put it down and I really enjoyed this uplifting story. Although parts of this one were a little slower and some things were a little far fetched it was still wonderful. If you are a fan of this author you will probablly die hard love this. If you are not you might not like it. This is one of those books that I could see as a love or hate book there really isnt anything inbetween. For me this one worked out great for this week after some very stressful situations. Go Into This One Knowing: Something To Read To Relax.